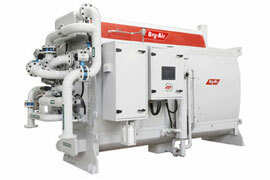 January 14, Delhi, India: Bry-Air (Asia), headquartered in India and Power Partners, Inc. of Athens, GA, USA have signed a license agreement for Bry-Air (Asia) to manufacture and sell Power Partners’ ECO-MAX brand Adsorption Chillers in India and other markets. This agreement means that Bry-Air (Asia) can further expand its broad product portfolio to include closed-loop adsorption products. Power Partners, Inc. markets energy-efficient, environmentally friendly ECO-MAX adsorption chillers that are manufactured in Athens, GA, USA. Adsorption chiller technology is attractive to hospitals, universities, office complexes, data centers, tri-generation facilities, processing plants, manufacturing plants and government facilities. Power Partners is part of PPI, a groundbreaking manufacturing company whose brands include Power Partners, ECO-MAX, Gap Partners and Change Partners. Learn more at ppiway.com/ecomax. Bry-Air Asia is a global leader in the business of desiccant dehumidification (rotating wheel) systems and is a flagship company of the Pahwa Group. Bry-Air Asia has two state-of-the-art manufacturing facilities in India, fully owned subsidiaries in China, Malaysia, Switzerland, and Brazil, and a worldwide sales network. Bry-Air Asia’s plants are among the most modern in the industry — supported by computerized 3D designing, CNC fabrication, powder coating facilities and automated conveying systems — and are ISO 9001:2008 and ISO 14001:2004 certified. For more information, visit us at www.bryair.com/news-and-event.